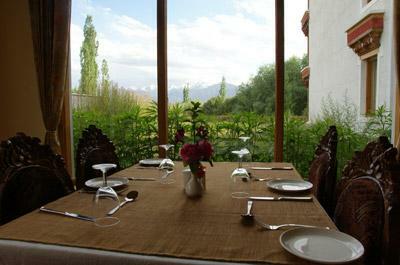 The Druk Ladakh is a 4 star property, located at 5.6 kms from Leh Airport and 3.7 kms from Local Bus Stand. The hotel is also an ideal place for those who come for sightseeing purposes as the hotel is very near to many sightseeing places that include Prayer Wheel (1.3 kms), Leh Royal Palace (3.9 km s), Hall of Fame 6.2 kms Spituk Monastery 8.6 kms), Gurdwara Pathar Sahib (25.2 kms) and Magnetic Hill (28.8 kms). Nearest Railway Station is Jammu Tawi (706 kms) that is well connected with Delhi Kolkata and Mumbai. Complimentary Newspapers in Lobby, Backup Generator, Taxi Service, Audio-Visual Equipment, Laundry Facilities, Front Desk, Business Facilities, Major Credit Card Accepted, Room Service, Family/Child Friendly. Internet Access, Makeup/Shaving Mirror, H/C Water, Dustbins, Telephone, Cable/Satellite TV, Air Conditioning Room, Complimentary Toiletries, Television Room, Bottled Water in Room. Banquet Facilities, Business Facilities, Doctor on Call, Laundry Facilities, Room Service, Bar. User reviews for "The Druk Hotel Leh"